From I-95, take exit 3 to Route 138 east. After passing Route 2 in West Kingston, you'll cross over the railroad tracks via a bridge. Just after you cross this bridge, you'll see a sign for Kingston Station/Amtrak on your right. Pull in and park near the back of the parking lot. The William C. O'Neill Bike Path, formally known as the South County Bike Path starts alongside the railroad tracks near the Kingston Train Station. This is an active rail line serving Amtrak. The Amtrak Acela train passes by this station, but does not stop, going 130 mph. Check inside the station for its schedule if you wish to watch it wiz by. There is also a restroom inside the station, as well as a RR Museum. 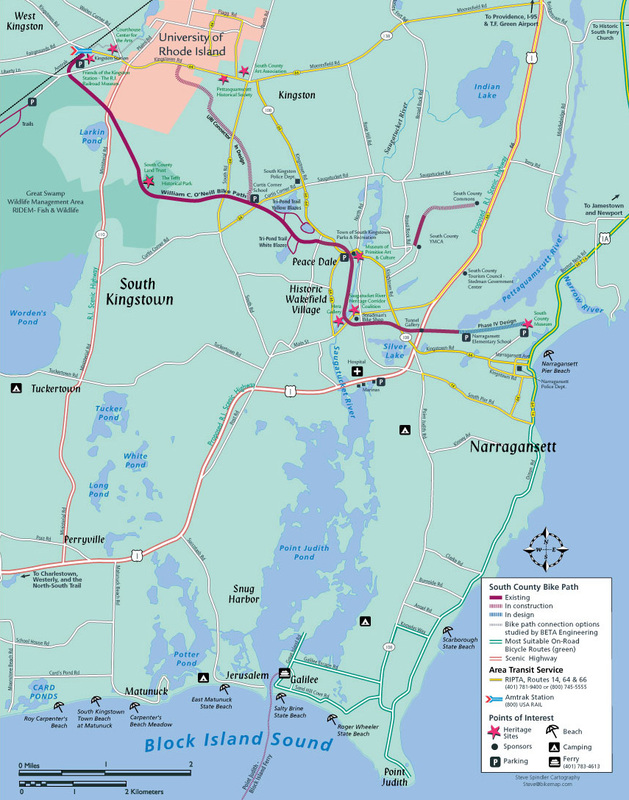 The bike path was built on the former Narragansett Pier Railroad Line that traveled from Kingston Station to the Narragansett Pier Terminal, 8 ½ miles away. The station was built in 1875 and the rail line in 1876. For more information visit; BIKE RI or WILLIAM O'NEILL BIKE PATH . Starting from Kingston Station; The trail starts alongside the train tracks at the back of the parking lot. A map board and informational sign are located here. Note; Heading north from the train station if you travel underneath Route 138 you'll come to an old RR Signal Station on the right at a 1/4 mile. You'll pass by the 0 mileage marker just 0.1 miles down the trail. These markers are placed every mile along the trail. I refer to distances from this marker even though it's an extra 0.1 miles from the parking lot. Just past this marker, on your right, is another informational sign board explaining about the Narragansett Pier Railroad Turntable. Several more informational signs are also posted along the path. The trail heads away from the RR line and crosses Liberty Lane where it travels through wetland forest. The trail follows alongside the eastern edge of the Great Swamp Management Area. You'll cross over the Chipuxet River before coming to Ministerial Rd after 0.8 miles. Cross-walks, but use caution as traffic speeds are fast. Next, you cross a wooden bridge over the White Horn Brook/Genesee Swamp after 1.3 miles. After crossing this bridge look for two large boulders on your left. Keep going. Next, look for a cement culvert running under the trail. About a tenth of a mile further along, up a small knoll to your left will be two more large boulders. You may not spot them until you've passed by them. Follow the dirt path up to the boulders and then continue for 7 paces (2 steps = 1 pace) into the woods along a Pine needle path. A large Pine tree will be too you’re left. Turn right and follow another path 8 paces to a split in the trail. Left takes you to an old cemetery, which you can check out later, but you need to head right for 10 paces. This brings you to a break in a stone wall. Finally, turn right and follow the stone wall another 5 paces to a double-trunked tree next to the wall. Go to the same side of the wall as the tree and look near the bottom of the high point in the stone wall. Remove a single rock which is covering a cavity in the wall. Here you will find the South County Bike Path Letterbox with a small rock on top of it to protect it. Continuing onward, the trail has a slight upward grade as you pass by a covered bench before coming to a cross-walk over South Rd at 2.8 miles. You'll come to Curtis Corner Rd at 3.2 miles. The Curtis Corner Middle School is on your left. After crossing Asa Pond Rd you'll pass by the Tri-Pond Park hiking trail. Just past the 4 mile marker is Fagan Park, which contains a water fountain, playground and picnic tables. The trail now travels through residential area as it heads slightly downhill to a ramp out to Kingstown Rd. A cross-light gets you over this busy road where you'll travel past artwork & murals before coming back to Kingstown Rd in Peacedale at 4.5 miles. Sign board located here. Shops and eateries, as well as, the beautiful old brick and ironwork John Fagan building (1899) are located to your right. Another cross-light will take you over to Railroad St for a short on-road section (very little traffic). Along this street is the old Peacedale Railroad Station; well preserved. You then cross over Church St after only 0.1 miles, where the paved trail picks up again and runs alongside the Riverside Cemetery to your left. Next, you cross a bridge over the Saugatucket River. Look right and you'll spot another pedestrian bridge crossing the river downstream. You then emerge onto Main St in Wakefield at 5.4 miles. Plenty of places to eat and shop. Note; You may take a 0.6 mile detour loop from here by heading right down Main St. Just past an old red trolley car, now converted into the Little Red Trolley Gallery, turn right and travel over the river along the pedestrian bridge. This will bring you to the backside of Wakefield School. A pavilion overlooks the river here. Follow the paved path left past a Veterans Memorial and out to High St. Travel left down High St to Main St. Turn left again and pass by a dam a fish ladder on the Saugatucket River. A boardwalk on your left then takes you alongside the river to a paved path along the river and back to the pedestrian bridge where you can return to the bike path. Use the cross-light over Main St where the trail continues through an urban trench and underneath Woodruff Ave. After two more street crossings the trail comes to Route 108 after 6 miles. Another map board located her. A cross-light will take you over Route 108 to an on-road section along MacArthur Blvd (residential road). Follow this road for 0.2 miles to where the paved trail picks up again on the right. Travel underneath Route 1 where the town allows graffiti artists to work freely in the tunnel. You travel through open woods and a National Wildlife Refugee. The trail currently ends after 7 miles at Mumford Rd. Future plans look to extend the trail out to Narragansett Beach. There are currently 3 different routes being considered as of September 2011. Note; An on-road route from here will bring you out to Narragansett Beach and back along a scenic loop. See below. From the end of the William C. O'Neill Bike Path; Head right on-road along Mumford Rd (residential) and travel past Narragansett Elementary School. Turn left and travel through the parking lot keeping the ball field to your right. Continue past the Narragansett Community Center, Parks Dept. and small pond before passing through the Sprague Memorial Field parking lot out to Kingston Rd (Route 1A). Follow the wide sidewalk left (east) and you'll come to the Narragansett Indian Monument at the junction of Kingston Rd, Strathmore Rd and Narragansett Ave. Cross over Kingston Rd at the cross-light. Kingston Road heads south (you'll loop back on this road), you continue east on-road along Narragansett Ave (now Route 1A). This section has a lot of parked cars during the Summer so Caution is urged. Narragansett Ave (Route 1A) veers left and affords you a wide shoulder out to Beach St. Use the cross-light over to the sea wall and head right, then a quick left and you'll come to a wide path that runs along the sea wall at 1.1 miles. Great views of Narragansett Beach. Note; During the Summer season this path becomes mobbed with pedestrians, so you'll need to cross back over and travel south on-road along Beach St & Ocean Rd. Follow the paved path between the sea wall and Beach St south. Continue left as you pick up Ocean Rd. This brings you to the historic NARRAGANSETT TOWERS , followed by the old Coast Guard House. The Narragansett Towers were part of the Narragansett Pier Casino built in 1886. For more information visit; COAST GUARD HOUSE RESTAURANT . Continue following the seawall alongside Ocean Ave and you'll come Pier 5 at 2 miles. This is where the old Narragansett Pier RR ended its journey. Head right on-road up S Pier Rd to Gibson Ave & Boon St. Turn right along Boon St (commercial). When you reach Congdon St next to the park look left to spot the old Narragansett RR Station with an old caboose behind it. Continue along Boon St past the old Fire Station with the stone tower to Central St at 2.7 miles. Turn left up Central Ave (residential) and follow a section of the "Path to Health" route, designated by blue & yellow signs. Homes from the 1800's and the beautiful St Peters stone church. Turn right at 5th Ave (Path to Health route) past the Town Hall building and then left onto Kingston Road. You'll return to Route 1A across from the Narragansett Indian Monument. Cross over Route 1A and head left along Kingston Rd, then right past Sprague Memorial Field out to Mumford Rd. Turn right and return to the William C. O'Neill Bike Path after a 3.8 mile loop.